Filed under apple on August 25, 2014. My wife and I are done paying $150/month for mobile phone service on two iPhones. We both have an iPhone 4s and we are ready for an upgrade to the phones and the service. After some research and use by other family members, we chose to go the Virgin Mobile route. Part of the switch will involve an upgrade from our iPhone 4s to iPhone 5s. 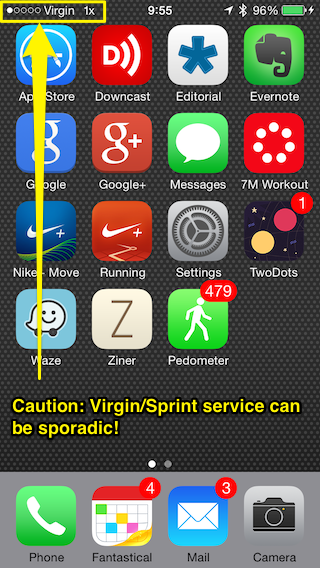 I’ve written about the iPhone 5s, so in this post I will share why we chose to switch from Verizon to Virgin Mobile. I also provide some concerns you must consider should you want to join us in the mobile phone money saving revolution as described in the video below hosted by Sir Richard Branson. The choice seems obvious. So why isn’t everyone using Virgin Mobile? Two main reasons, the initial cost of ownership and the service coverage. I’ll first discuss the initial cost and then demonstrate how much money I will save over a two year period. Finally, I’ll dive into a discussion of the service and a few additional features and tips to maximize your value. As stated, the main reason for the switch was to save money. I went into the Virgin plan expecting to pay $35 per month per phone for unlimited Internet, unlimited text messages and 300 minutes of talk time. I did not expect to find that iPhone users can get the same service for $30 per month with auto pay! That alone saves me $120 annually for two phones. The difference between Virgin Mobile’s non-contract plan and Verizon’s contact plan is that you have to buy your phone at the unsubsidized rate. That means you pay more than the $150-200 subsidized phone cost from the other carriers. On the other hand, you own your phone immediately and are not locked into any contracts. There’s a sense of freedom with this approach. Verizon includes mobile hotspot activation and Virgin charges $5 per/day. See Mobile Hotspot section below. Let’s break the cost down into an easy to read table. UPDATE - September 7, 2014: We sold our two iPhone 4s phones to Amazon to for $190.00. That’s means our two-year savings is now $2050.00. If there is any downside to Virgin, it has to be service availability. Virgin rides on top of the Sprint network. Before you make the switch, check out the Virgin Mobile coverage map. I’ve found in our area coverage is good and provides LTE in most of my neck of the woods. A further look at the map reveals several spots nationally without coverage. If you travel frequently or are not in one of the coverage areas, this is not the plan for you. For me, Virgin Mobile fits the bill nicely. I have LTE available in my area. I rarely travel to areas that do not have Sprint coverage and due to the nature of my job, I always have ubiquitous Wi-Fi access. If you have a similar situation, you will enjoy Virgin mobile and especially the savings. Let me talk about one other feature others may see as a negative. I mentioned mobile hotspot activation earlier and the cost of $5 per day. “Per day” is a bit fuzzy. You can maximize a day if you know the details. Mobile hotspot expires when you reach 250Mb or midnight the day after the initial activation. So if you activate at 9:00am on a Wednesday, you will have mobile hotspot availability until Thursday at 11:59pm. That’s two full workdays. Again, that’s if you don’t burn through your 250Mb first. Many will point out that 250Mb “ain’t much” and $5 per day is a bit steep. As for the first point, read my (Five Ways to Reduce iPhone-Data Usage) post to minimize your data usage. Also keep in mind that mobile hotspot usage does not count against your iPhone unlimited data. As I stated earlier, I am not a heavy user of the mobile hotspot feature as I have Wi-Fi everywhere, so this is not a concern for me and fits my usage habits nicely. I’d rather pay for the hotspot when I need it, rather than pay for it when I don’t. If you use your phone heavily as a hotspot, Virgin may not be the service for you or you may want to purchase a Virgin Mobile Broadband2Go hotspot. 300 phone minutes probably won’t seem like much to many users. I rarely use this amount myself, but in times where I feel I might go over the limit, I make heavy use of two technologies: Google Hangouts and FaceTime Audio. Virgin provides unlimited data and both Google Hangouts and FaceTime Audio use data to make the audio call. With Google Hangouts, I can call any phone in the United States for free. That means I can use Google Hangouts to make that call to tech support or the doctor’s office that will surely place me on hold for 20 minutes. FaceTime Audio is reserved for friends, family and colleagues who also use iPhones; which is most of them. You are probably familiar with FaceTime video conferencing. FaceTime Audio is the same, sans the video feed. Both FaceTime Audio and Google Hangouts are great and provide clear audio calls. It’s a great way to maximize those 300 standard minutes. Bonus points tip: Create a Google Voice number and provide it as your contact number. When people call, it will ring to Google Hangouts. One additional characteristic of Virgin Mobile that may turn off customers is the month-to-month top-up card. Why should I have to buy a little card to top-up my account? The truth is, you don’t have to. As I stated, I was able to save $5 per month by tying a credit card to my account for monthly billing. Additionally, using cards to top-up your account can save you even more money. On rare occasions, you can find a top-up card at a reduced rate and apply that to your balance. If you add enough to pay your bill, Virgin will not charge your card, but you still get the $5 discount. After you tell your family what a huge fan of Virgin Mobile you are, you are sure to get top-up cards for your birthday, graduation or other holidays. Even more savings! One last way to save money is to use a referral link such as this one. Every referral yields a $25 savings. If everyone out there clicks on the link and joins Virgin Mobile, I save money. Now don’t you want to help a guy save some money? You do? Well, get to clicking and not only save me money but yourself as well. For my usage, Virgin Mobile makes perfect sense and saves me a ton of money. If you live in an area where coverage is good and can live with the few caveats I note above, I think you too will find it an amazing value. Did you make the change to Virgin? What’s been your experience? Know a better way to save money on mobile phone plans (iPhone only please)? Drop a comment below.